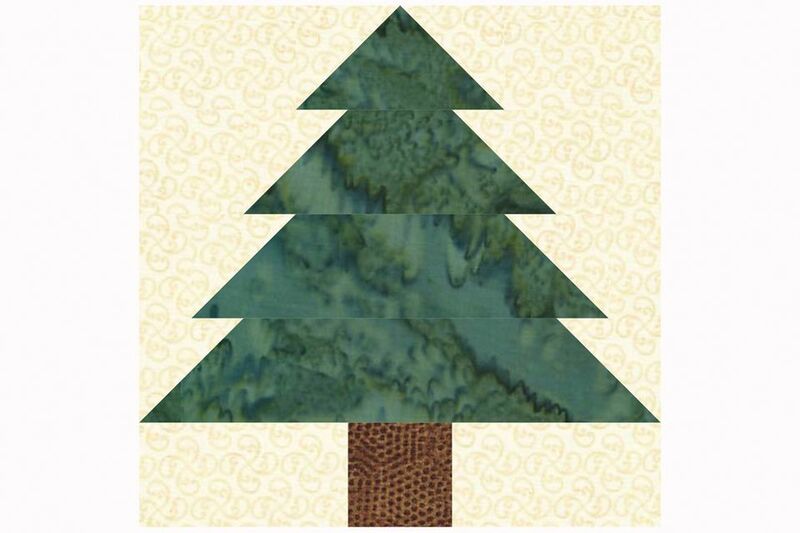 Use this 10" Christmas Tree quilt block pattern to sew a forest of easy 10" patchwork trees. The angled ends alongside tree branches are simple to sew using a quick-pieced Flying Geese method—the same method used to make pieced Snowball quilt block corners. The tree is illustrated with a light background, but any mottled, tone-on-tone fabric or smallish print will work. Make your trees and background realistic, or choose something entirely whimsical. The Christmas tree quilt block pattern is perfect for holiday projects, but don't hesitate to use it for any quilt. Try a four seasons wallhanging, sewing the branches and background for each block with fabrics that represent the shift of seasons. Dress up the Christmas Tree blocks by cutting teddy bears, Christmas packages, Christmas stockings and other items from printed fabric. Hand or machine applique the prints to the block or press them in place with fusible web. Use a quick piecing method to put backgrounds alongside each end of the tree branch strips. The steps required to make the flying geese unit that forms the top of the tree are illustrated in the top row above. Add triangles to the ends of all green strips in the same way. Gather your 2-1/2" background squares and your green tree strips. Draw a line from one corner to the opposite corner on the reverse side of each square. Align a square with the right end of the shortest tree strip as shown in the upper left of the illustration, right sides of the fabrics together. Be sure to position the drawn line as shown. Sew a seam directly on the drawn line. Press to set the seam (a good technique for all seams). Trim away the excess fabric, leaving about 1/4" of both layers extending past the seam line as shown. Flip the triangle right side up, pressing the seam allowance either direction. Repeat to sew another square to the opposite end of the green strip, positioning the line as shown. Trim and press. Repeat to sew tips on the remaining three green strips. Use a 1/4" seam allowance to assemble the remaining portions of the Christmas Tree quilt block, placing units right sides together for sewing and matching raw edges carefully. Use straight pins to hold fabrics together to keep patches aligned. Arrange the Christmas Tree quilt block components as shown in the illustration, upper left. Start by placing your tree strip units in front of you, from shortest branches to longest working downward. a 1-1/2" x 2-1/2" background strip on each side of the 8-1/2" long tree strip unit; the 2-1/2" edge will be sewn to the tree. The 10-1/2" long tree strip unit is complete as-is. Place a 2-1/2" x 4-1/2" background strip on each side of the 2-1/2" brown square. Sew the components of each Christmas Tree row together. Press seam allowances in tree branch units towards the background strips. Press seam allowances in the trunk unit towards the brown trunk. The Christmas Tree quilt block should measure 10-1/2" x 10-1/2". If the quilt block is smaller or skewed, press again and recheck. If it still isn't quite right, use an easy squaring-up method before sewing it to other blocks.